Did you know there’s a whole day dedicated to promoting and celebrating recycling in America? America Recycles Day is a nationally recognized day that encourages communities to participate in various activities that promote recycling and influence others to get involved. As advocates of recycling, reducing waste, and improving waste diversion, we wanted to do our part and educate our readers to help us celebrate such an important day in our country! 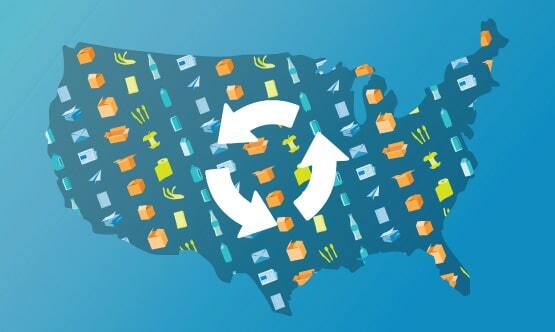 Read on to discover how you can participate this America Recycles Day, and every day. America Recycles Day (ARD) was started by the National Recycling Coalition in 1997 and is celebrated annually on November 15th. Since 2009, ARD has become an initiative of the environmental group Keep America Beautiful (KAB). The goal of ARD is to promote recycling and increase the country's recycling rate, which is currently stagnant at 34%. Keep America Beautiful encourages consumers and businesses to host or attend an event to raise awareness about recycling, so the practice can become part of their everyday lives. Keep America Beautiful also asks that everyone commit to recycling by taking the #BeRecycled pledge, which challenges America to “learn, act, and share”. So far, over 76,000 people have taken the pledge this year. It's important to know what's recyclable so the wrong items don't end up in your recycling. 'Breaking it down' creates more space in your dumpster, reducing the number of pickups needed. Get the most value for your recyclables by keeping your clean materials and landfill items separate. Food waste is heavy and expensive to throw away as waste. Composting is much more cost-effective! Styrofoam, plastic grocery bags, and greasy pizza boxes are among the items that are not recyclable! Inform your coworkers about why recycling is so important and share these tips with them. Take the #BeRecycled pledge, which asks you to learn what materials are collected for recycling in your community, act by reducing the amount of waste you produce, and share the pledge with friends and family. It's also not too late to sign up to host your own event! In the past, cities have hosted shoe recycling campaigns, volunteers have organized trail clean-ups, and schools have set up awareness booths on campus to promote recycling among their community. All event will help make a difference and we're excited to see the ideas people come up with this year! Join Keep Irving Beautiful and seniors from the YMCA team to promote and collect recyclables in Irving, TX. Students Offering Service is hosting its annual America Recycles Day Fall Festival on Thursday, Nov. 15. There will be games, food, and prizes from 3:45 - 5:45. Keep Pennsylvania Beautiful and its affiliate network hold special collection events throughout the state for hard to recycle items. Learn more. RoadRunner has encouraged each of our employees to take the pledge, and many of us will be participating in America Recycles Day, whether it’s by sharing the #BeRecycled pledge or attending a local event. We're eager to hear how you plan on celebrating America Recycles Day, let us know in the comment section below!